It can sometimes be a struggle trying to keep up with all of the different plans available from different carriers, and today we have some details about the upcoming VZ Edge program although at this point the monthly fee required is unknown. This appears to be an extension of a new device payment plan that was introduced by Verizon back in April that enabled users to upgrade phones if they purchased them at full price with payments following over the next 12 months. Leaked details suggest that the new VZ Edge upgrade initiative is going to be introduced on August 25. 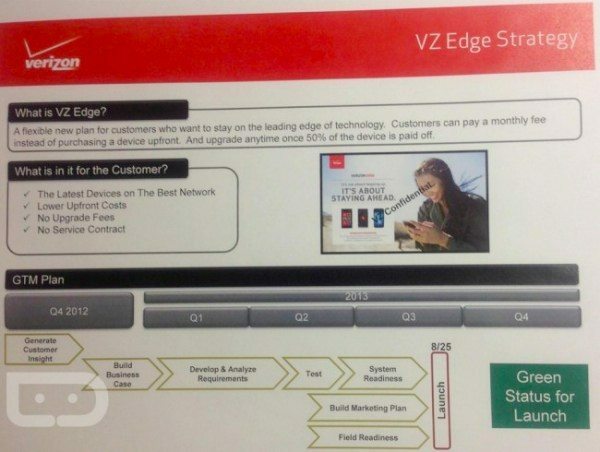 A training slide has emerged that shows details of the plan and promotes it as, “A flexible new plan for customers who want to stay on the leading edge of technology.” It also says that instead of purchasing a device upfront, the new plan will mean that customers can instead pay a monthly fee and will be able to upgrade at any point as soon as 50% of the device price has been paid off. Benefits to the customer of this new plan are claimed as being able to choose the latest devices on the best network (as Verizon itself describes it), with no upgrade fees or service contract and cheaper upfront costs. VZ Edge does sound as though it could be really advantageous to the customer as many people would like to be able to upgrade more often, and this certainly sounds as though it would make life easier. There is some question though about keeping unlimited data and while nothing seems to be clear yet, we’d point out that customers are allowed to keep unlimited data if participating in the payment plan we mentioned at the top. As VZ Edge looks to be an expansion on that plan, the signs are promising. No doubt the full details of VZ Edge will be clarified very soon, and we’ll be passing on that news when Big Red announces the new plan. What are your initial thoughts on the VZ Edge plan? Send your comments to let us know.